Andrew bought an apartment in an elite housing estate of Moscow in 2007, when it was still on construction stage. The key factors of attraction were convenient location, good traffic interchanges and ecology — the Setun river and Volynski Wood are situated right by the house. The construction was complete over a year, and in the lodging, which represented a common empty perimeter, refurbishment process was launched. The layout plan is a fruit of work of a professional architect (Alexandra Logvinova), who suggested a few interesting solutions on the spot – just on finding out the hosts’ needs. 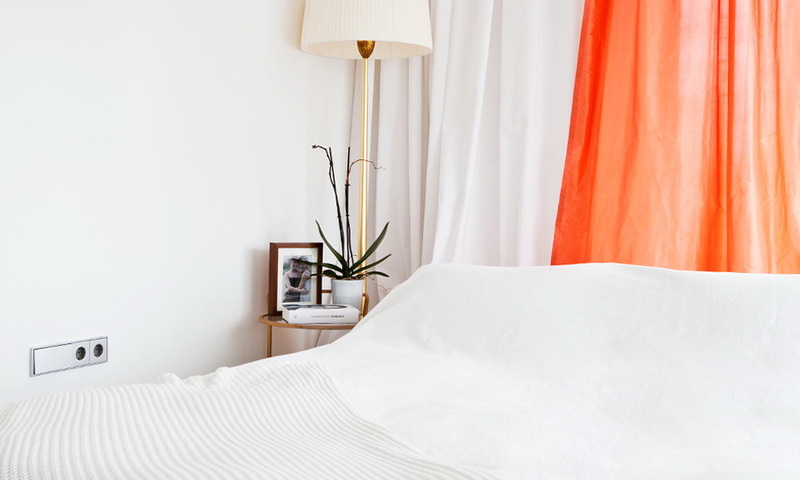 These were full-fledged bedroom and guest’s room, and a roomy and light lounge — Andrew and Larisa are fond of throwing dinner parties and receiving guests. 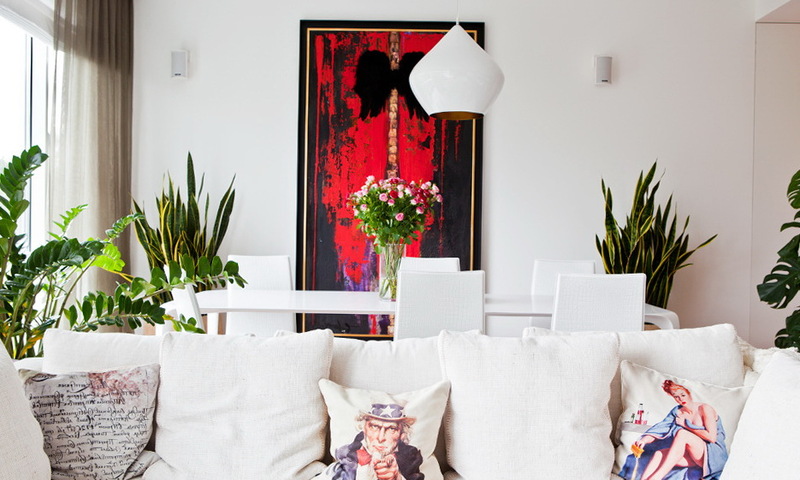 As for the style content, the hosts gave preference to European minimalism, its light colors and simple shapes. The layout and décor works were finished back then: all the walls were built, new flooring was laid, all doors and sanitaryware were installed. Still, the flat was absolutely inhabitable up to last winter, when Andrew and Larisa decided to move in here in one day. Without waiting for the ordered furniture, they brought here some stuff from their ex-lodging and started to live in an empty space furnished with a sole sofa. Most of the furniture items of Italian brands were transported right from the manufacturers by friends, employees of Total Interiors Group company. Some of the things were hand made by Larisa’s sister, whose hobby is making clothes, furniture and interior stuff. Despite her love for single interior style concepts, Larisa wished to have something outstanding in the entrance hall. 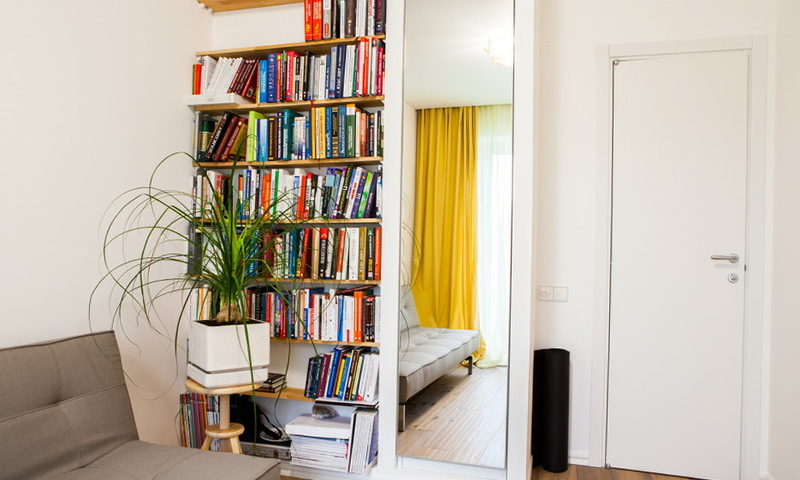 A classic-style mirror was ordered from a small framing shop in Moscow. Many interior items wanted for this lodging were too costly or time-consuming in ordering, but thanks to the handy sister of Larisa this problem was quickly solved. All the curtains, including the bathroom ones, a white leather couch and a carpet with the same edging are of her own make. For the carpet, which was valued at 7,000 Euro in Italy, Larisa and her sister picked up a mat in a common interior stuff store and had it trimmed with the same leather, which was used for the couch upholstering. 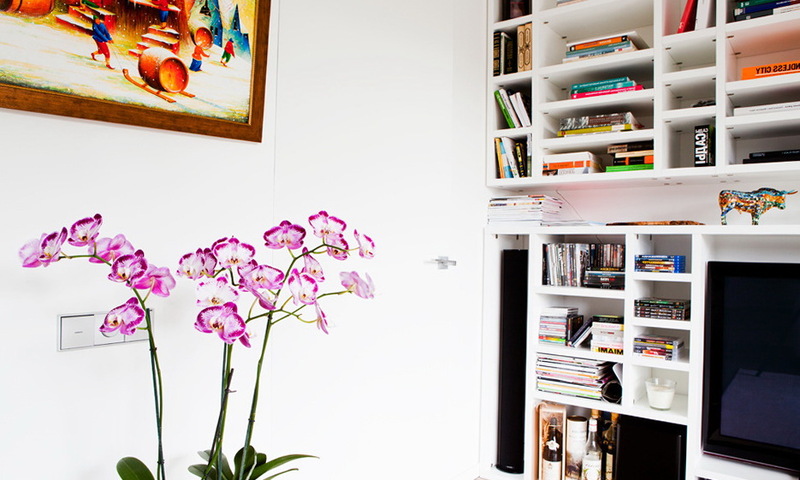 One of the walls was supplemented with a wall-length built-in closet, including a utility corner. The right door in the entrance hall leads to the guest’s WC. 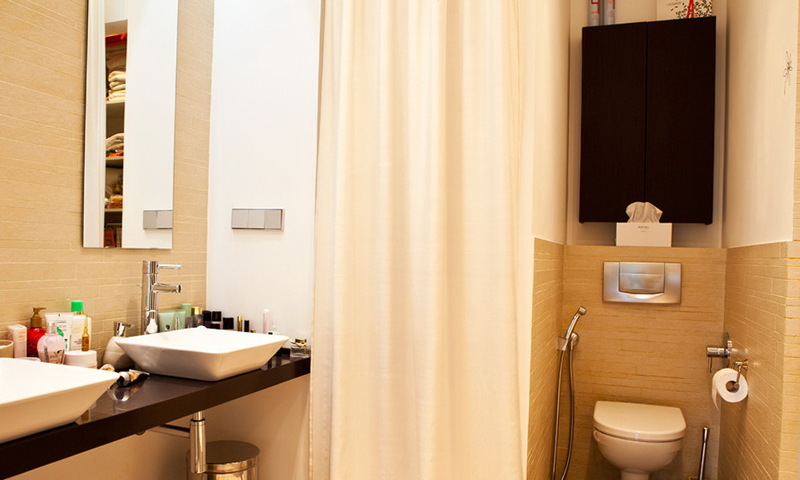 Opposite the guest’s WC there is a guest’s bedroom equipped with one more sanitary unit. True, this zone isn’t finished yet. The hosts are still looking for a dream arm-chair and plan to hang here a shelf. “The Victory of Peresvet” picture is a colleague’s gift to Andrew. Sofa by Innovation, Denmark. The home library features generally Nobel prize winners. 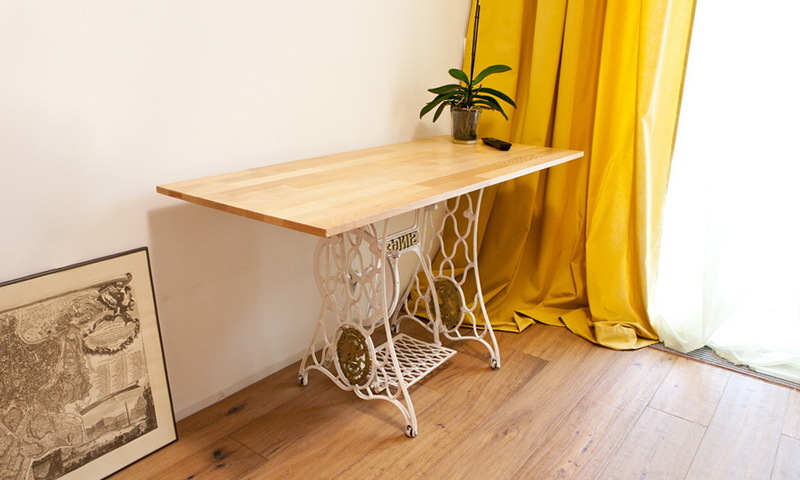 A sewing machine by Singer of 1912, which serves as a table base, was bought from Avito.ru. 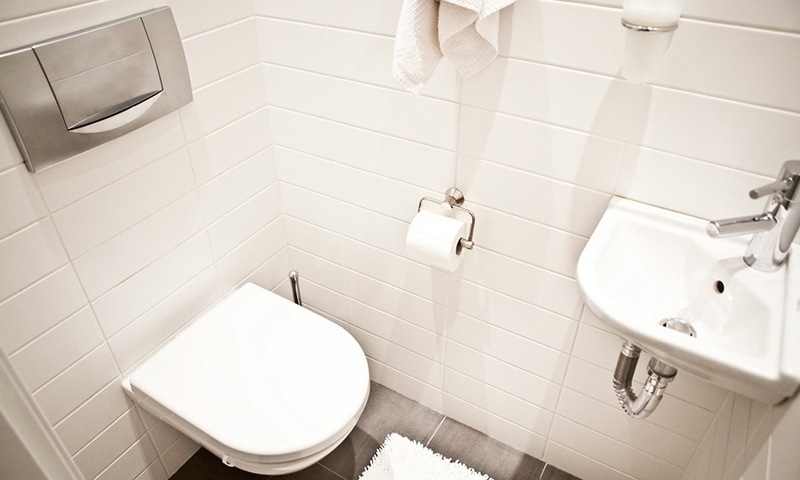 White is the basic interior color. It’s absolutely comfortable for both of the spouses, gives airiness to the space and enables the use of multiple contrasts and bright details. The architect’s offer was to equip this open-plan apartment with two pylons, so that their sections visually divided the space with panoramic room-length windows. But the hosts rejected this idea to preserve maximum openness and lightness of the lounge zone. On sunny summer days this room looks truly spectacular. 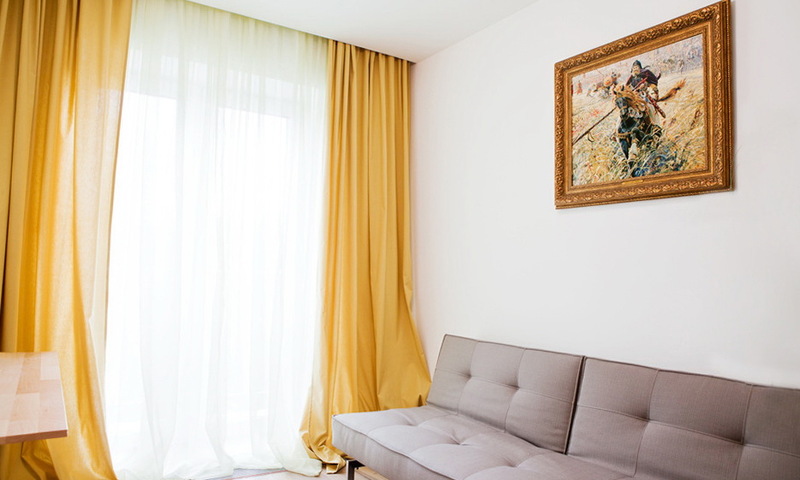 According to the hosts, they don’t even need paintings – greenery behind the window perfectly copes with decorative function. 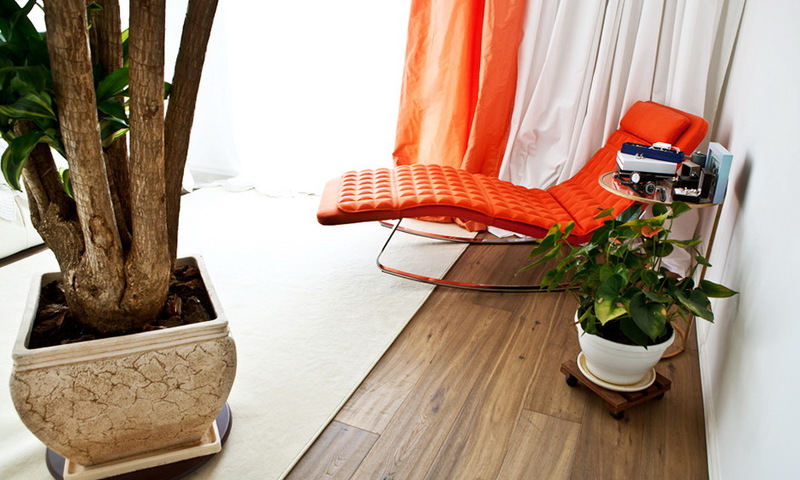 Upholstered furniture in the living room belongs to the hosts’ favorite brand – B&B (Italy). Curtains are one more sister’s creation. Numerous plants in the flat are Larisa’s responsibility. 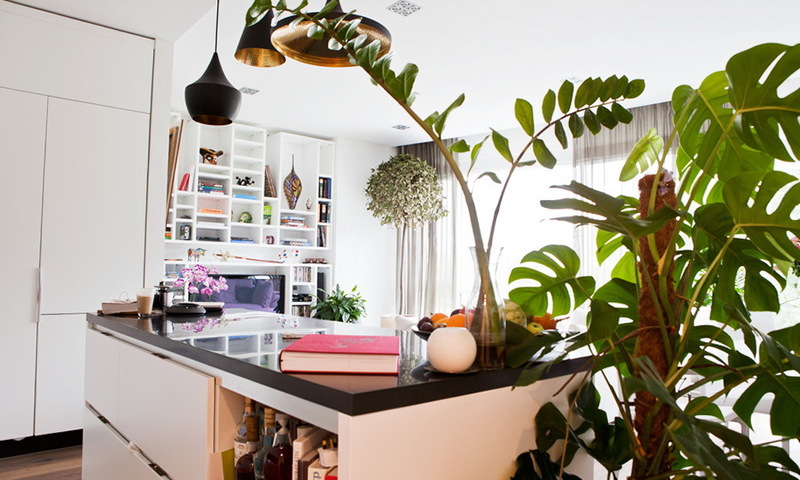 Thanks to the great metric area and high ceilings, she managed to plant a real bay tree, which proved to be useful from both decorative and cooking aspects. A picture of St. Petersburg artist “The Fallen Angel” depicting the despots of 19th-20th centuries is a sister’s gift. Both sides of it had to be adorned with symmetrically hanging white lamps by Tom Dixon, but at the moment you can see only one: it turned out that for the second one they have to reinforce the beam or perforate the ceiling. A massive table, 2.5 meters long and weighing 130 kilos, along with a B&B sofa turned out not very mobile, and the removal men had a hard time with them. Kitchen set — Giulia Novars. 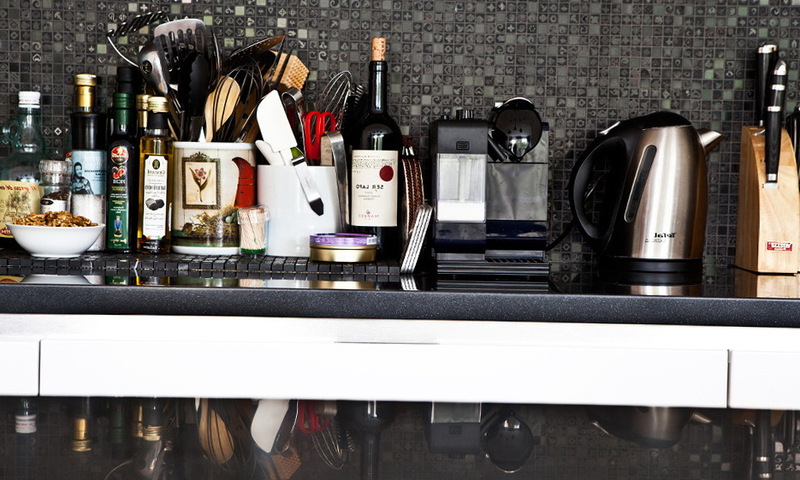 Originally the tiling, as well as the table top, was made from flaring black corian (artificial stone), but with time Larisa decided to adorn it with mosaic of natural stone found in a building materials store. 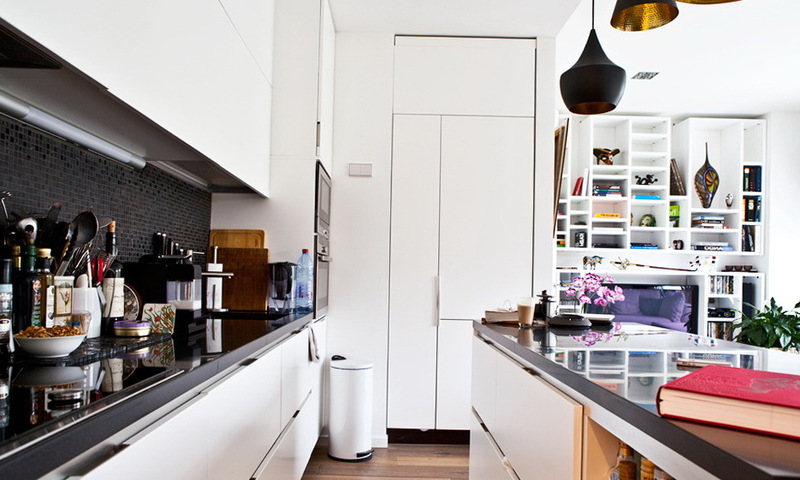 The primary plan was a common table instead of a kitchen island, but the idea proved to be extremely functional in practice: it included a built-in wine cabinet and a huge collection of tableware, which Larisa brought from the previous flat. 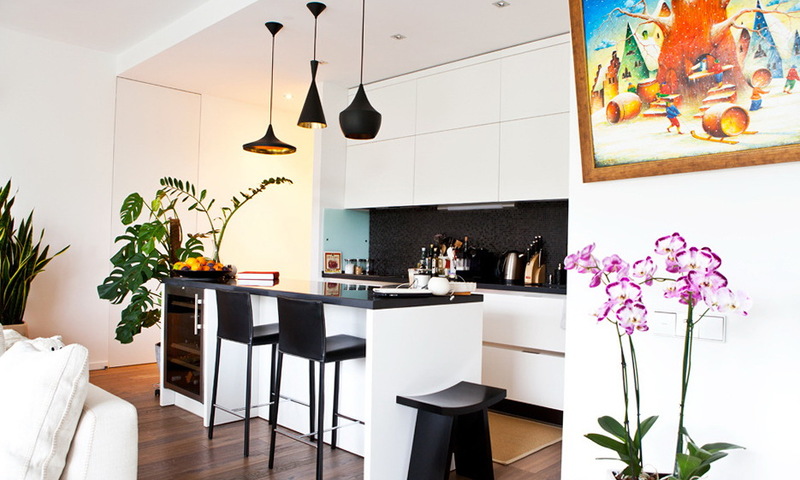 Lamps — Tom Dixon, stool — BoConcept, chairs — Antonella. Acid-motley picture by Shchedrin was a parents’ housewarming gift to Larisa. A similar bookstand weighing about 800 kilos was spotted in an Italian catalogue, and this one was ordered from Russian manufacturers. A Murano vase was brought from Venice, while the masks were painted by the hosts, who spent the whole day with a master, who didn’t know a word in English. Casanova mask turned out extremely expensive — for painting it Andrew chose gold leaf, silver and copper. 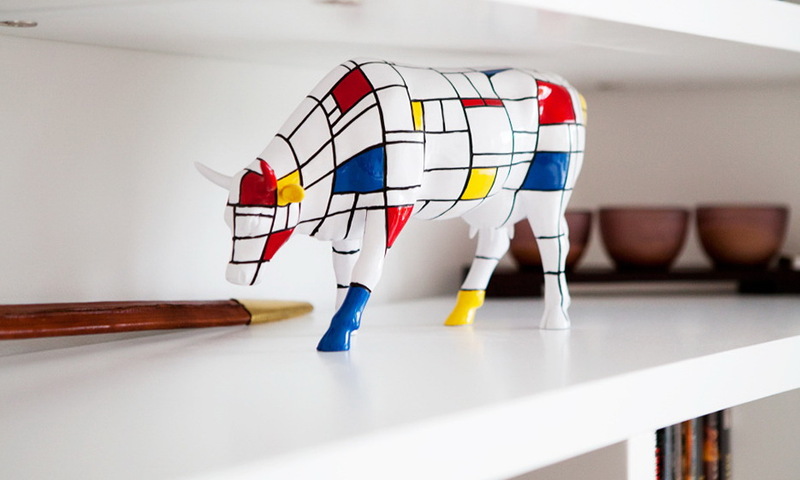 A Mondrian cow arrived from Holland, a bull – from Seville. A sharp sword, which is a copy of Fernando Cortés’s rapier, is a gift from Toledo. 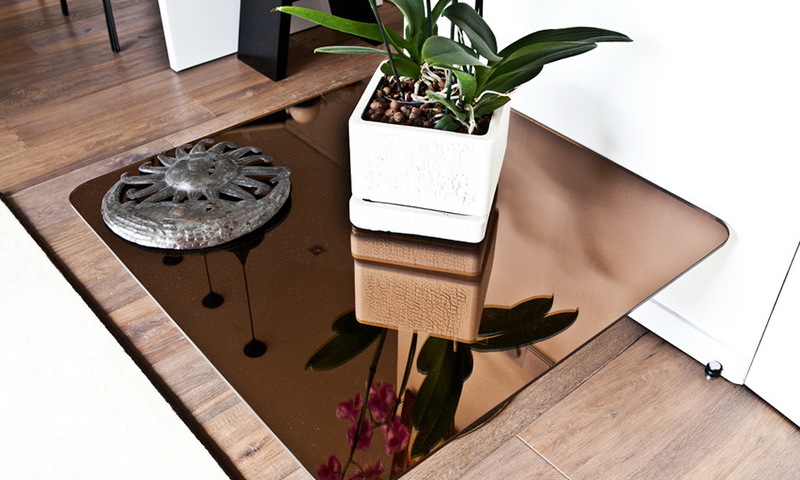 Lamps by Tom Dixon were ordered right from the manufacturer, and for the sake of getting the lowest transportation price the hosts had to buy a table with a mirrored copper surface, which actually fit well into the interior. Ceiling-high doors matching the wall color were custom-designed and made by Union company for two reasons – the hosts didn’t wish any door cases and wanted the ceiling to look even higher. To the right from the bedroom entrance there are a bathroom and a walk-in closet. 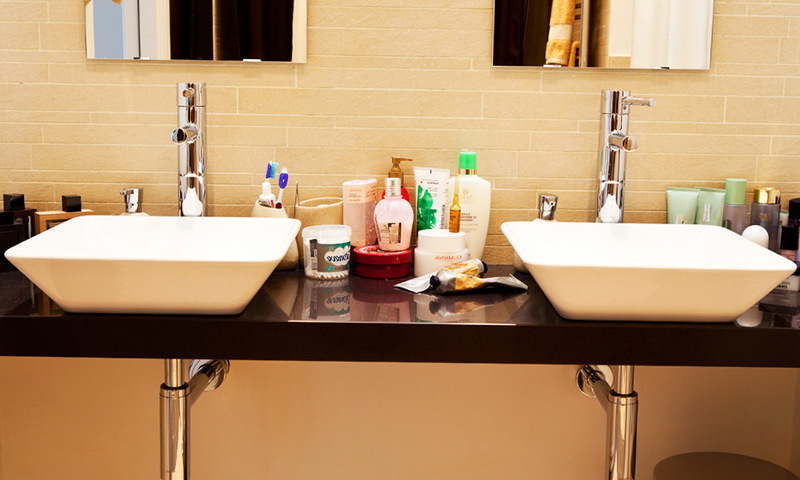 Two sinks in the bathroom proved to be not very functional in practice. Daily life is not so cinematic: the hosts use them simultaneously once in a blue moon. The bedroom was destined to be fully covered with a cashmere and wool carpet, but in the end it wouldn’t fit into, and the hosts cut it into pieces. One of them was put in the lounge. Leather bed — B&B, bedspread — Zara Home, plaid — IKEA. Curtains and a standard lamp are another masterpieces of Larisa’s sister.